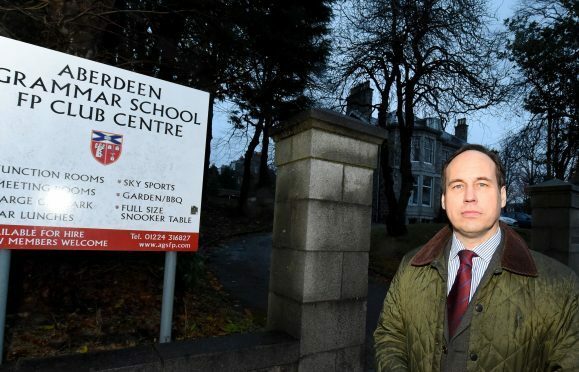 Aberdeen Grammar School Former Pupils Club (AGSFPC) is to offload its £2million premises at 86 Queens Road, in what supporters are lamenting as a sad loss for the city. The centre opened in 1969, and provides a social point for ex-pupils and rugby, cricket, hockey and football groups. As the home of the Aberdeen Grammar amateur rugby club, it has played host to scores of sporting greats over the last five decades. And the venue’s meeting rooms, bars and function spaces serve as a base for several community groups and music societies. But centre manager David Leighton said the club’s finances were being “squeezed” on several fronts – most notably by increases to their non-domestic rates. The recent revaluations left the centre paying out almost £20,000 each year, an 18% increase of about £3,600. Mr Leighton said: “The assessors who did this just don’t know what they are doing, they don’t have any real grasp of what it’s like to be in a commercial environment. “They are sitting behind their desks making up rules with no idea of the real effect they are having on people. The Scottish Government sparked anger across the north-east earlier this year when it announced increases to the business rates – which were based on calculations made before the oil price stump. Ministers belatedly responded to criticism in February by capping rates increases at 12.5% in the hospitality sector. However, as the centre belongs to a private club it does not benefit from the relief package. It is hoped that the west end property will sell for around £2million as the club looks for a new home. But as the city’s property market has declined in recent years, members have expressed concern that it could have fetched double that sum if sold a few years ago. Mr Leighton said the rates rise was chief among a number of circumstances “conspiring against” the club. The listed building dates back to 1860 and is expensive to maintain. The club rents out its parking spaces to nearby businesses, but the recent introduction of rates on car parking mean that more than 50% of that income has been lost. And the reduction of the drink-driving alcohol limit from 80mg to 50mg in every 100ml of blood has also led to a drop in trade, he said. However, Mr Leighton admitted that the club’s ageing membership should have adopted a more proactive approach to attracting new users. It is expected that the building will not be vacated until after April 2019, and the club is yet to form plans for the income generated by its sale. Martin Greig, councillor for the city’s Hazlehead, Queen’s Cross and Countesswells ward, last night lamented the building’s demise. He said: “The club has a long history of supporting sport and leisure activities in Aberdeen, and hopefully members will be able to continue their outstanding record of volunteering.